For those of us who live in the West, we are accustomed to summertime fire warnings. And the recent tragedy in Yarnell, Arizona, that cost the lives of 19 elite firefighters, and the loss of at least 360 homes in Colorado, is a sober reminder of how dangerous and devastating fires can be. Additionally, those firefighters lost in Yarnell were the largest loss of firefighters in one event since the loss of 343 on 9/11. That’s why I’m proud to lend my support to the Red Knights International Firefighters Motorcycle Club’s silent auction that will be held in Rutland, Vermont during their Annual International Convention from August 15-18, 2013. Members of the RKIMC and their guests will place their bids for the items donated for the purpose of raising money for the many charities and causes that the club supports. The winners will be announced on Saturday, August 17. According the Centers for Disease Control and Prevention (CDC), an average of 100 firefighters die each year in the line of duty. Mark Green, a volunteer firefighter in Charlestown, New Hampshire and a member of the Red Knights, Vermont Chapter 2, says that 56 firefighters across the United States have died in the line of duty as of July 1, 2013. “At this rate, we may surpass the yearly average before the end of the year”, Green says. As part of this year’s convention, as in past conventions, more than 350 Red Knights will ride, en mass, to a memorial service at the Vermont Fire Academy to pay their respects to those brave souls lost in the line of duty. The Red Knights consist of current and former firefighters who share the joy of riding motorcycles and presenting a positive image of motorcycling to the public. Started in 1982 by 11 active firefighters in Boylston, Massachusetts, the club now has approximately 10,000 members in 17 countries. 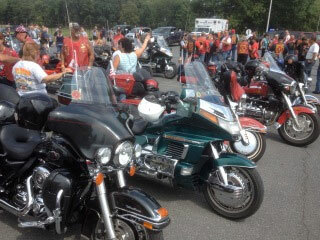 In addition to enjoying the open road whenever they can, the Red Knights hold many charity events every year. I’m proud that my giclée donation plays a part of this worthy effort and extend my heartfelt thanks to the brave men and women who risk their lives everyday for the sake of saving lives and property. For more information on the Red Knights International Firefighters Motorcycle Club, please see the organization's website: www.redknightsmc.org.